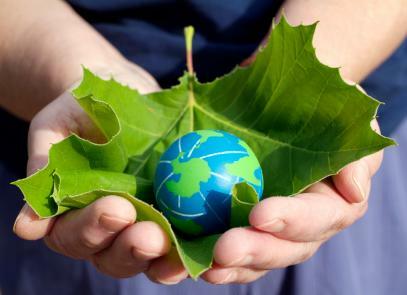 When coming up with Earth Day crafts for kids, think about ways to appreciate the Earth. Earth Day is a global celebration that gives everyone a chance to step back and appreciate all the wonderful things about the planet Earth. Doing fun crafts on Earth Day inspires youngsters to take better care of the environment around them. Many themes can be used for Earth Day. Think weather, nature, and of course, recycling. A few weeks before you start your craft project, save key recyclables such as toilet paper and paper towel tubes, jugs of milk, or scrap paper. Use plain coffee filters to make an easy water-related craft. Flatten out one coffee filter on a large plate, and color the areas where the oceans and land will be using craft markers. Fill in the areas, allowing some space between the land and water for the sprayed water to blend in the colors. Fill a spray bottle with plain water, and spray the coffee filter a few times starting in the center. Wait a minute to allow the water to spread. Spray a couple more times, only as needed, to allow the colors to spread and merge into one Earth. Let the coffee filter dry. Allow the kids to show you areas of land and sea on the planet Earth they created. Creating different collages of the planet using bits of paper are fun Earth Day crafts for kids. Cut up bits of old construction paper or magazines in blue and green colors, using different shapes. On a paper plate or a drawn circle on plain white paper, draw land masses to represent the different continents. The rest of the areas will be the oceans. This will help the kids map out where to glue the pieces of paper. Using a glue stick, have the kids attach the pieces of colored paper into the areas mapped out as land or ocean. Continue until all of the background is filled in and let the collage dry. In the center of card stock, draw a shape slightly smaller than the size of the picture the kids will be using in the frame. This shape can be round or square, in whatever size will fit the picture better. Draw a large round border around it in the shape of the sun. The sun's rays on the outside can be simple zigzags in a circle, or the sun's rays can be curly or curvy. Have the kids color the sunray border with different yellow, orange and gold crayons. Cut out the center shape and the sun border itself. Glue or tape the photo on the back of the homemade picture frame with the picture showing through the center of the sun. Using recycled, empty bathroom tissue rolls, attach long crepe paper strips to the base for a windsock. Color or paint the empty tissue roll using blues, greens and browns. You can also draw pictures such as clouds, plants and animals. Cut strips of crepe paper about 12-inches long and tape or glue to one end of the tube on the inside. If you are using glue, allow the strips to dry before hanging. Punch holes on either side of the opposite end and tie kitchen twine to the tube, making a hanging loop. Use for a hanging decoration for Earth Day. Celebrate Earth Day by creating crafts using recycled materials around the house. Yesterday's newspaper can be made into papier-mache projects or even biodegradable seedling containers. For girls, old buttons and keys can be made into a lovely bracelet for Earth Day and throughout the year.